These two cards were made using Painter’s tape. 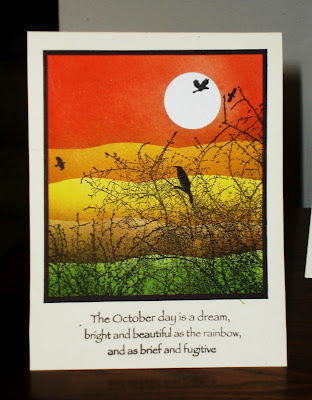 I used a mix of Memento’s ink and Distress inks, applying it with an synthetic sponge. and Penny Black ( Winter Sky #4204L). 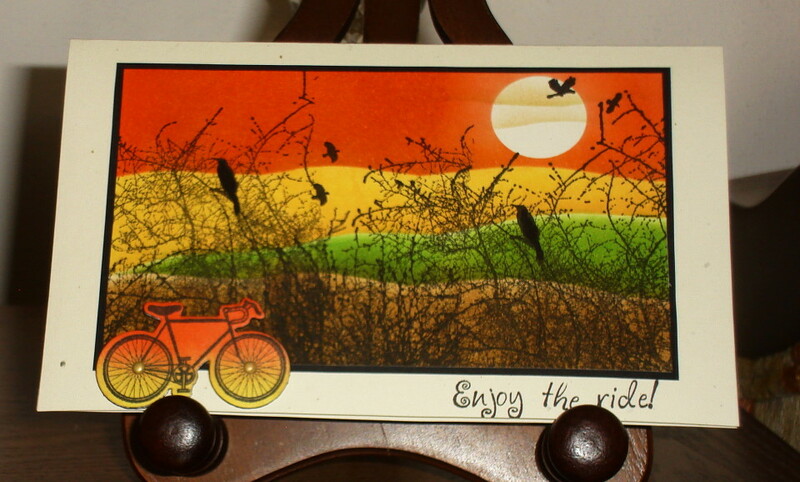 Enjoy the Ride from Penny Black. We never could have guessed you'd used painter's tape. Glorious colours to create your scene Vada. Such warmth. Love the landscape effect you created with the painters tape! 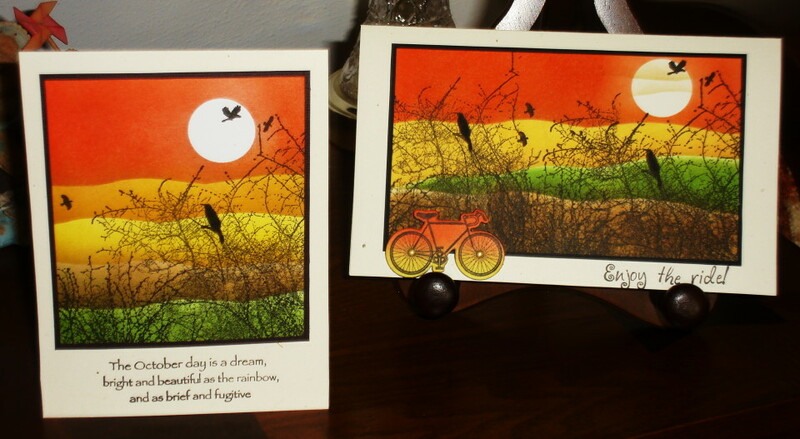 Beautiful Fall colors on both of these stunning cards. I may have missed it, but I don't see a link to Frilly and Funkie! Thank you for joining in the fun! Hugs! Beautiful card, Vada, really gorgeous, and like Lynne says, never would have guessed you used the painter's tape! Stunning artwork Ms. V! Love this peaceful scene you've created! Well Ii just knew there had to be a better use for painters tape than what I use it for. Urika!!! you found it. 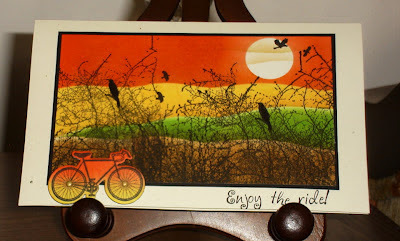 Gorgeous sunset cards Vada, kind of looks like the ones we have here because of all the fires. Not good for our forests but it sure makes for pretty sunsets. Be still my sunset loving heart! This is absolutely stunning...wow! I can feel the heat on my face! So so gorgeous! Thank you so much for playing along with us at Frilly & Funkie! WOW! What pops of colors. Just lovely. Great use of colours especially for this time of year! Painters tape (is that the same as masking tape?) works brilliantly! !